Edith Garland Dupré Library was designated a Federal Depository Library in 1938. 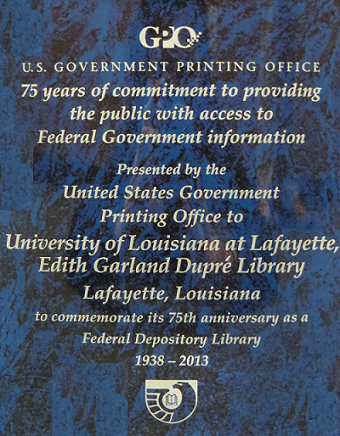 As a selective depository, the Library receives 40 percent of selections available to depository libraries through the Federal Depository Library Program of the U.S. Government Publishing Office (formerly, the Government Printing Office). Formats and media include tangible (print, audio-visual, microform) and online publications. Reference and information services are provided by the Reference and Research Services department and the Head of Government Information in the Special Collections department. These publications have SuDoc call numbers. These publications have Library of Congress (LC) call numbers. Circulation of most documents is allowed. Consultations or appointments may be scheduled for research assistance and library instruction sessions. << Previous: What Is Government Information?